DAP is now playing the race card by fielding self proclaimed Himpunan Hijau chairman Wong Tack, popularly known as arson Wong for his famous determination to burn down the Lynas plant if Pakatan wins the 13th general election. Wong Tack, shyly of course and humbly, accepted the offer by DAP, which at present anger the Himpunan Hijau’s committee members who questioned his move because they had promised to stay impartial and non-partisan. 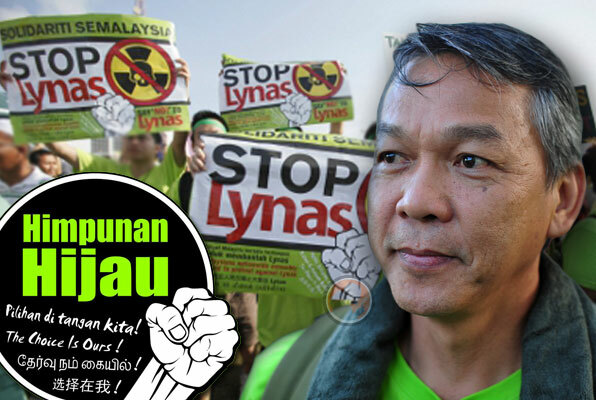 Wong Tack had promised them their fight was only to have Lynas out of Kuantan purportedly to protect the environment and people from the alleged radiation from the processes in the plant. Now, with much grandeur and pom-pom, Wong Tack raised his hands together with DAP’s owner Lim Guan Eng and pledged to serve the people of Bentong, Pahang. He claimed that this is after "weeks of intense discussion with the group's committee" and "with endorsements from leaders of the civil society, particularly on green issues". But how come the committee members came out in the Star daily asking Wong Tack why he went into politics when they had agreed to be free of political influence? So, imagine the ‘U-turn’ so suddenly…was the thought of being an MP is too attractive for Wong? Or is Wong having the same mind as Guan Eng – racial? Would a "true environmentalist" use a political platform of an opposition and agreed to back Australian miner Lynas operating a controversial rare earths processing plant, if a new public inquiry proves it to be safe. Why wouldn’t he stand for the general election on his own as Independent or under green banner (environmental flag) as some of the environmentalists in Europe and Australia did? And also if he and his group believed there is a need "to change the current regime", why not just throw their support behind the opposition pact instead of being a candidate of chauvinist party? Why is Wong so adamant about shutting down the Lynas to the extent of saying he was going to burn the plant decided to back a political pact that was willing to compromise their stand on Lynas? Until today, Wong Tack has never come out with any clarification on what Anwar has said in the interview but instead confirming he was going to contest under DAP ticket for Bentong parliamentary seat. Whatever Wong Tack had decided, it is obvious many people who stood behind him have now abandoned him, regretting their actions. And for DAP, fielding Wong in Bentong has stir another friction because the seat was contested by PKR and now PKR is angry, after being openly displaced without any discussion. The opposition pact is in an obvious state of friction and disagreement on everything not just party’s philosophies but even seats distribution. In reality, the end is near for the parties in the pact to disperse and go on their own strength and in this sense, there is actually no pact, just splinters of opposition trying to survive politically, not aiming for Putrajaya.